Pizza Pizza offers a delicious diverse menu – from wings, to pasta to sandwiches, and of course pizza! Perfect for all tastes and a great gift for any occasion. Founded in 1967, with over 400 locations across Ontario, Quebec, Manitoba, Nova Scotia (Halifax), and Saskatchewan, Pizza Pizza is guided by a mission to provide the ‘best food, made especially for you’ with a focus on quality ingredients, customer service, community contribution and continual innovation, especially in offering health-conscious menu choices. 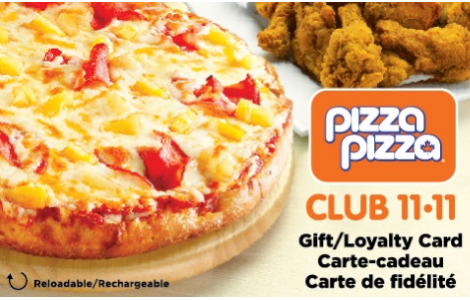 As a Pizza Pizza cardholder, you can register your card with Club 11-11 to earn 5% in Loyalty 'Dollars' back on every order and redeem after every 5th purchase! Visit pizzapizza.ca for details.Order your Pizza Pizza gift cards from National Gift Card Canada today! This card is redeemable for merchandise at participating Pizza Pizza restaurants and may not be redeemed for cash unless required by law. Protect the balance on your card by registering it at www.pizzapizza.ca. We will replace the balance remaining on registered cards at the time we are notified of the loss. Reload (up to $200) at participating Pizza Pizza restaurants or online. Check registered card balance at participating Pizza Pizza restaurants, online or call 1.866.368.2111. This card is the property of Pizza Pizza Limited. For complete terms, conditions and benefits, visit www.pizzapizza.ca. Use of this card constitutes acceptance of these terms and conditions.